Buy your A Bronx Tale on Broadway tickets before you go to New York. Buying theatre tickets online is simple and saves you time and money. 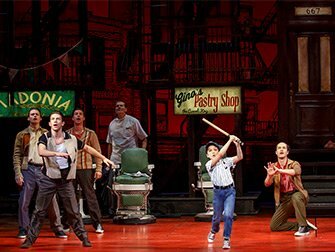 A Bronx Tale, produced by an award-winning team including Robert De Niro, among others, is playing at the Longacre Theatre. The musical tells the story of Calogero Anello, an Italian-American teenager growing up in The Bronx during the 1960’s, who bears witness to a murder. As he gets older, he becomes caught between two worlds. Should he follow the good example of his hardworking father, or that of his close friend and gangster Sonny? The script, that was turned into a movie of the same name (starring De Niro) was written by Chazz Palmenteri who based it on his own life story. How to buy A Bronx Tale on Broadway tickets? It’s easy to buy tickets to A Bronx Tale. Above you can select the date when you want to go. You’ll get an overview of all the tickets available. You can then choose how many tickets you would like, add them to your cart and pay right away. After paying, you’ll receive a confirmation and your voucher by email right away. You’ll exchange the voucher for tickets at the theater on the day of the show, at least one hour before the show starts. Eric’s Tip: I had seen the movie before and I would definitely recommend watching it before or after seeing the musical as there are a lot of comparisons. 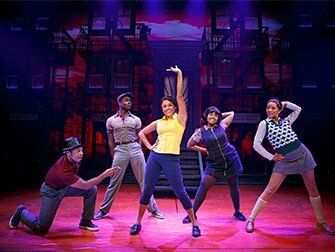 The musical reminded me a bit of West Side Story: a classic tale of impossible love. The theatre is small and cosy and there aren’t any bad seats. Children up to 4 years old aren’t allowed in the theatre. Recommended from age 12.